In their fourth successive year with kit supplier Nike, United were dressed in an all white away kit for 2012/13. The minimalist look went down well with the supporters, with the only designs being the Nike swoosh, Club crest and sponsorship. It boasted a round neck collar with no trims. Player of the year for the previous season, John Rankin, modelled the strip at the official launch. The kit continued with sponsorship from Calor Gas, again using a black and white logo design in the centre of the shirt to match well with United’s traditional colours. On the back of the shirts was a new sponsor. GA Engineering signed a two year deal with the Club and their black logo was positioned just above the player names. The shorts too came complete with a new sponsor, Digital Goldfish, who like Calor, adapted their sponsor to tie in with the look of the kit. The player names and numbers were in black this season. 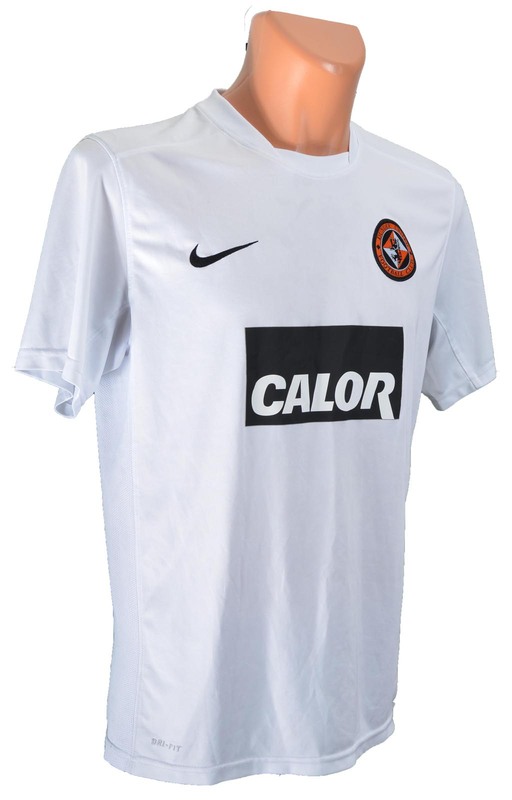 United first wore the shirt competitively at Fir Park, in a 1-0 victory on the 7th of November 2012. The last game in the kit was also at Motherwell in another 1-0 victory on February 19th 2013. This match against Motherwell was one of their best away performances of the season and Johnny Russell was the man who scored the winner that day.